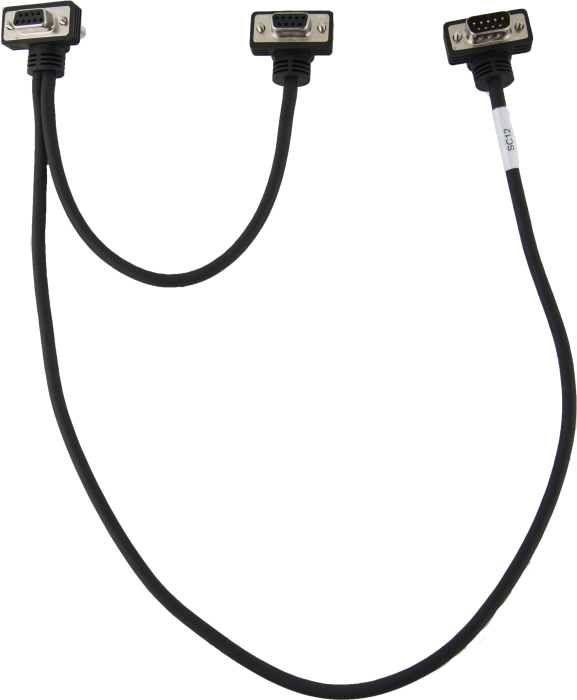 The SC12 is our standard cable for connecting the data logger's 9-pin serial I/O port to most peripherals with a 9-pin port. It is supplied with many of our standard communications peripherals. Its 9-pin male connector attaches to the data logger's CS I/O port, and the two 9-pin female connectors can attach to peripherals or interfaces. Formerly known as "the little blue ribbon cable"
The SC12 has one 9-pin male connector that attaches to the data logger's CS I/O port and two 9-pin female connectors that can attach to peripherals with a 9-pin RS-232 port. Additional peripherals can be connected by attaching one of the two female connectors with the male connector of an additional SC12 cable. The SC12 is compatible with any data logger that has a CS I/O port. Prior to June 2003, the SC12 was a ribbon cable. On June 18, 2003, Campbell Scientific began shipping a redesigned SC12 cable. The redesigned SC12 is a black molded cable that is more rugged and resistant to chemicals than the original ribbon cable. Although the two cables are largely interchangeable, the new black version is not compatible with the ET107 and some of our older products (see Compatibility). The redesigned SC12 cable has resulted in the obsolescence of the SC12R cable. However, the SC12R-6 cable will continue to be available. The SC12R-6 features a six foot length for applications where the peripherals must be separated by several feet. The SC12 is shipped with many of our standard communication peripherals (see Overview). Retired products that are compatible with this cable include the COM200, COM210, COM310, COM300, CR10KD, COM100, SAT ARGOS, ST-20, SAT HDR GOES, CR56, DC112, DC1765, DC95, RF95, SC232, SC32A, SC532, SC932, SC95A, SDC-RF, SM16, SM192, SM64, SM232A, SM716, [HSVM100], VS1, CSM1, DSP4. The newer black-molded SC12 cable is not compatible with the ET107, PS512M, CH512R, MetData1, or SDS511. The SC12 is compatible with any data logger with a nine-pin CS I/O port. What would happen if two data loggers were connected directly through CS I/O ports via an SC12 cable? Nothing. An unmodified SC12 cable does not allow for this type of connection; it provides a connection for one data logger and two CS I/O peripherals. What is the pinout for the SC12 cable? The SC12 cable is just pin-to-pin 1 through 9 and shell-to-shell, similar to a typical RS-232 cable. However, the SC12 cable uses a twisted pair to connect pin 1 to 1 and pin 2 to 2. The rest of the pins are connected using straight, unpaired conductors. The cable drain wire is used to connect the metal shells.